This is a sponsored post written by me on behalf of Hunt’s® tomatoes. All opinions are always 100% my own. 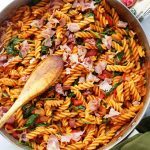 One Skillet BLT Pasta – Quick and easy 30-minute, one skillet pasta recipe with spinach, tomatoes and bacon! So much I love about this BLT Pasta right now. So, so much! But first. Hiiii! How are you? Happy about-to-be-the weekend! It’s been a whirlwind week around here; kids, work, keeping up with Brooks Ayers… aye aye aye. I’ve been BUSY! For that reason, sometimes I just need (want!) completely easy and quickquickquick dinners made in just one skillet. With bacon! And for the record, let me just say that, when all is said and done, and even when I DO have all the time in the world, I will still want, need and LOVE one skillet dinners. Just sayin’. Favorite thing about simple recipes like this is that the higher the quality of the ingredients, the fewer ingredients you will need because the flavor of even just one or two ingredients are going to be enough to bring out all the deliciousness. I’ve always had this thing about high quality ingredients because, if I’m going to use the good stuff, I want to taste the good stuff, you know? 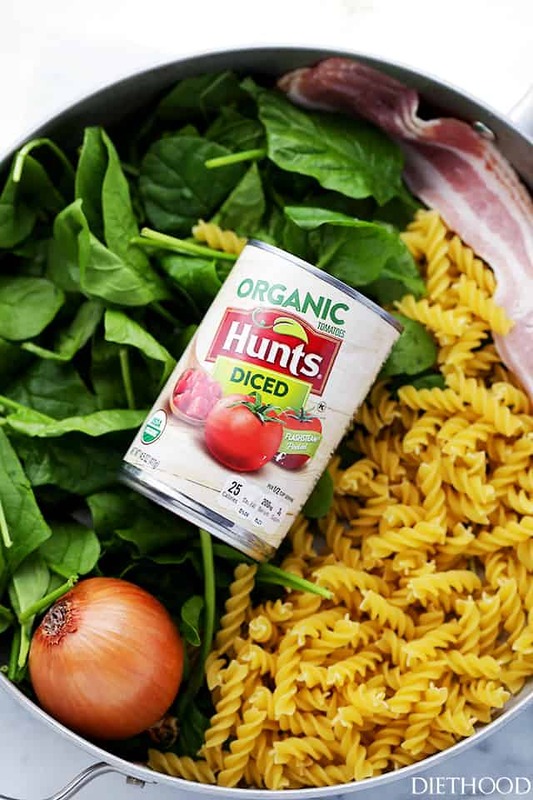 Thus, this weeknight beauty is loaded with Hunt’s® ORGANIC Diced Tomatoes which added a wonderful tangy flavor to our pasta, as well as great texture and taste. Also, if I could just remind you that Hunt’s® uses steam from simple hot water to peel its tomatoes, while some other companies peel with chemicals like *lye. Although, Lye peeling is recognized as safe by the FDA and has no adverse effects on the healthfulness of tomatoes. 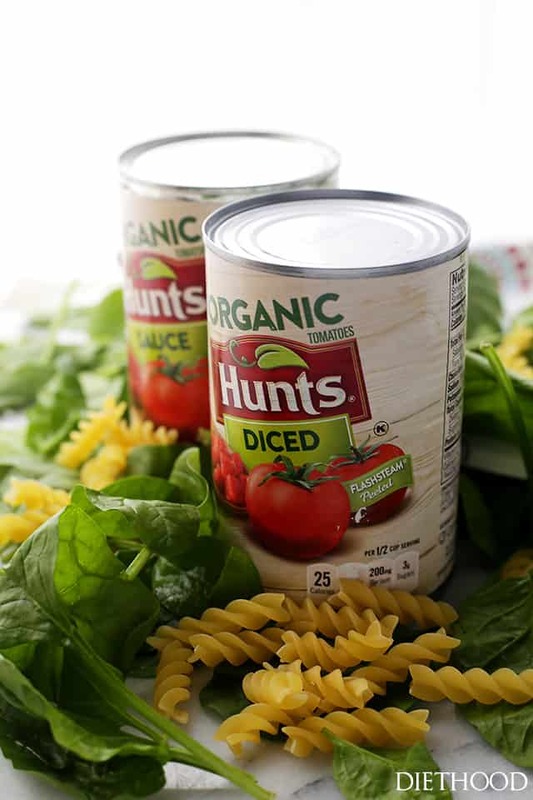 Nevertheless, it’s still good to know that Hunt’s® peel all their diced, whole, stewed tomatoes using FlashSteam with steam from simple hot water, and no chemical by-products get put back into the earth. But you guys. 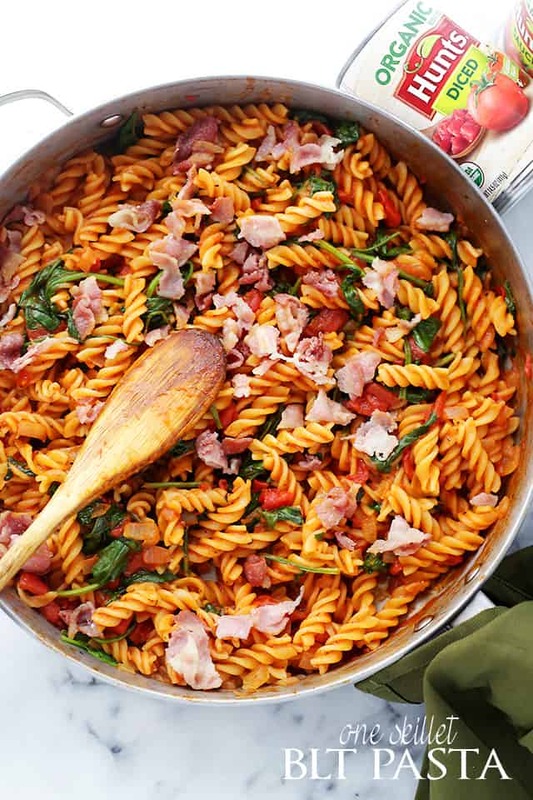 This BLT pasta deal is making me look like I have it all-together, you know? On-the-ready and all June-Cleaver-mommy-like. It can do the same for you! Obviously, I am so in love with this recipe on so many levels. I mean, first and foremost, it’s under 30 minutes, start to finish. Secondly, all ingredients should be hiding in your pantry. Mostly. The only exception is maybe Hunt’s® ORGANIC Diced Tomatoes which you must go hunt for because they’re so good. Thirdly, your other half may ask to have an entire skillet made just for him. Alright, I think I’ve talked it up enough and it’s probably time for me to leave you alone for a little while. But just remember that this meal is fantastically, wonderfully simple and you must make it ASAP. 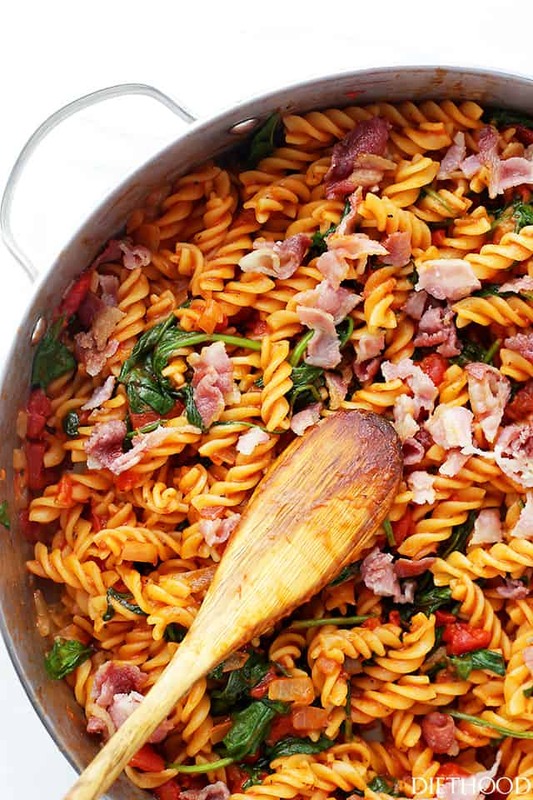 Quick and easy 30-minute, one skillet pasta recipe with spinach, tomatoes and bacon! Add onion and cook for 3 to 5 minutes, or until tender. 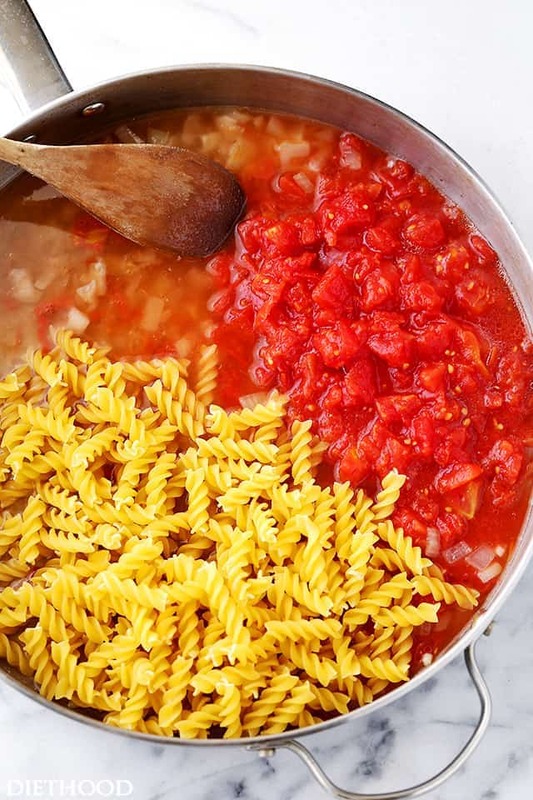 Add undrained tomatoes, water, tomato sauce, pasta and garlic salt; stir to combine and bring to a boil. Cover; reduce heat and cook for 12 minutes or until pasta is almost tender. In the meantime, heat bacon in microwave according to package directions. Remove cover from skillet and add spinach on top of pasta mixture. 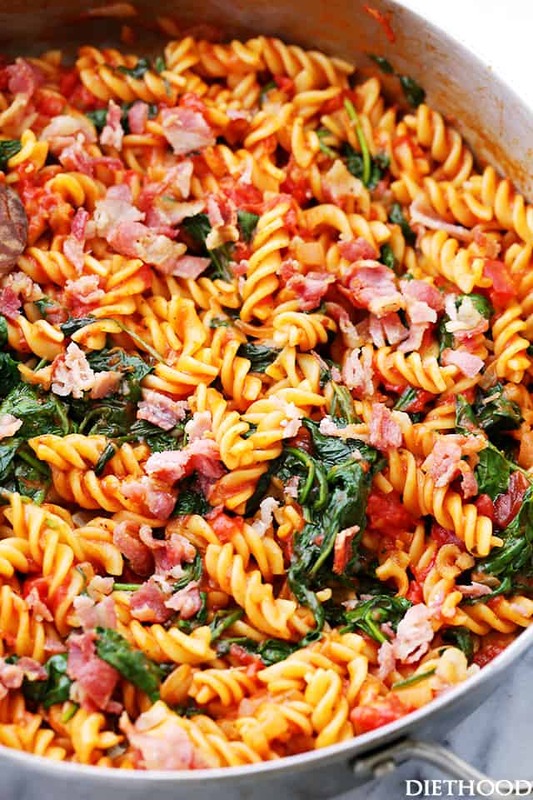 Cover; cook for 2 to 3 minutes, or until spinach wilts and pasta is tender. Add bacon; stir to combine. Serve with Parmesan cheese, if desired. Simple, flavorful pastas are exactly what I crave! I am not a fan of the sauce filled dishes, rather, healthy ingredient filled dishes! And bacon…well who can turn down bacon?! OMG Heaven! Everything you make I WANT! I love, love, love one pot meals! This has everything I need to feel happy and satisfied! Now this is how to do dinner! Love easy skillet recipes like this one Kate! This is my favorite kind of weeknight meal! confession- In some instances, pasta trumps bread. This may be one of them. This may give your ketchup one a run for it’s money. 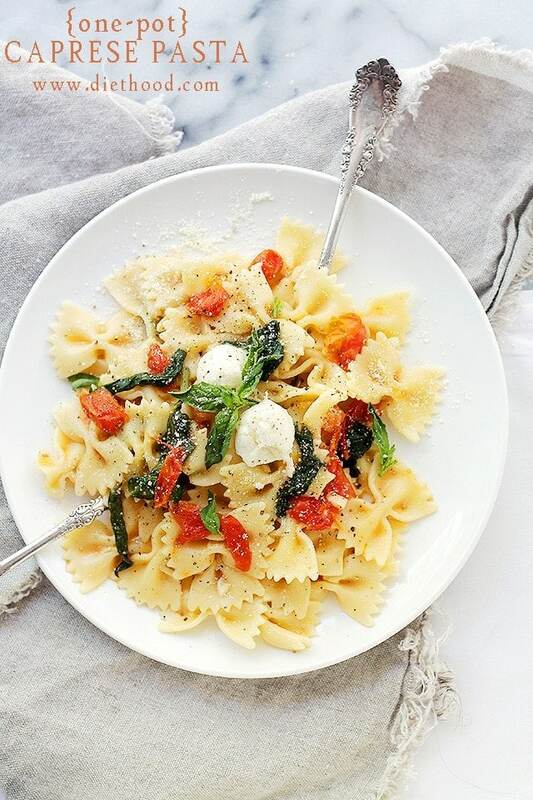 This pasta looks fantastic Katerina! I could go for a huge plate of this right now! 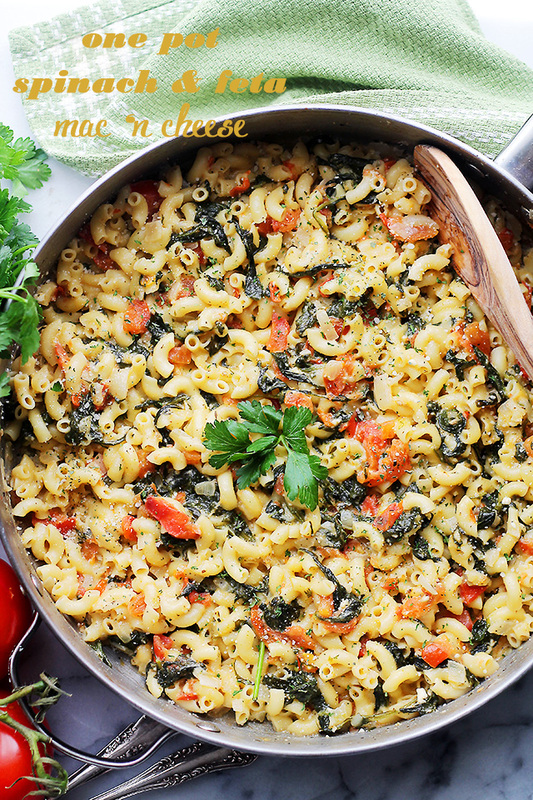 You had me at one skillet, I need a big bowl of this pasta! This looks so good and I can’t wait to make it. My days have been crazy too! What’s up with this time of year? 🙂 Easy pasta skillets are my favorite to make and this looks fantastic!